As of July 2016, 44 children (20 boys, 24 girls) ranging in ages 6 to 17 have been treated in our program (current clients excluded). 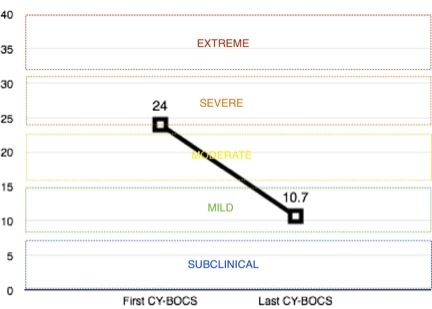 The graph below shows the average OCD severity score as measured by the Children’s Yale-Brown Obsessive Compulsive Scale (CY-BOCS) at the start and end of the program. Data come from the 11 children who both completed a program and were given the CY-BOCS at a date reasonably close to the start and end of the program. As can be seen, the average child began treatment with moderate-to-severe OCD symptoms and ended the program with mild OCD symptoms. A reduction in CY-BOCS scores of at least 25% indicates a significant response to treatment while a reduction of at least 45% to 50% or a CY-BOCS score of 14 or below indicates remission of OCD1. Based on these criteria all 11 children were treatment responders by the end of their program, with 8 of these 11 also achieving full remission. 1Storch, E. A., Lewin, A. B., De Nadai, A. S., & Murphy, T. K. (2010). Defining treatment response and remission in Obsessive-Compulsive Disorder: A signal detection analysis of the Children’s Yale-Brown Obsessive Compulsive Scale. Journal of the American Academy of Child & Adolescent Psychiatry 49(7), 708-717.